An infusion nurse is a registered nurse who specializes in the administration of medications and fluids through an intravenous (IV) line, central line, or venous access port. They can work as a resource to a hospital by starting lines and training new nurses in obtaining and maintaining IV access. 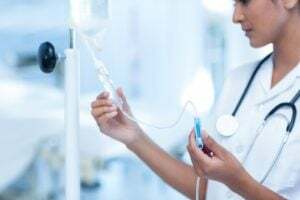 An infusion nurse must be skilled in pharmacology, laboratory tests, and sometimes even telemetry to safely monitor patients throughout infusion therapy. They also have a steady hand, keen eye, and a lot of patience. Starting peripheral intravenous lines is a skill best learned through experience. There are many techniques that result in successful IV starts, and many "tricks" nurses learn along the way. No two patients are the same, and neither are their veins. A nurse can build upon prior experience to obtain IV access on even the most challenging patients. What Are the Educational Requirements for Infusion Nurses? Those looking to become infusion nurses must first complete an accredited nursing program and obtain a nursing license. They can choose to earn an ADN or BSN nursing degree. BSN nurses have a broader range of opportunities, as they can pursue supervisory roles as well as become clinical nurse educators. Applicants who are approved to take the exam can schedule a date to test. There are 300 testing sites globally and the testing process takes about three hours. Re-certification is required every three years. Nurses can either take an exam or complete 40 hours of continuing education credits to renew their certification. What Happens If an Infusion Nurse Has Trouble Gaining Access to a Patient's Vein/Central Line? Do Infusion Nurses Make House Calls? Where Do Infusion Nurses Work? What Do Infusion Nurses do? Infusion nurses are responsible for initiating and maintaining intravenous lines and tubing, administering medication and fluid therapy, and educating families on line maintenance and treatment. What Are the Roles and Duties of an Infusion Nurse? Infusion nurses can be in high demand. Many patients are being discharged from the hospital still needing to continue treatment. A medically stable patient would not need a lengthy hospital stay simply to receive infusions. Outpatient infusions have become more prevalent as hospitals work to reduce costs. According to The National Home Infusion Association website,home infusion is a safe and effective alternative to inpatient infusion treatment, and allows patients to resume normal activities more timely. This results in a higher demand for infusion nurses. According to salary.com, an infusion nurse earns a median salary of $83,171.This can vary, however, based on the state and organization in which the nurse is employed.